Jessie, a 25 year old Quarter Horse mare, is a retired show horse who has been struggling with increasing discomfort ambulating and has been observed to be less active the past 6-8 months. She received a diagnosis of bilateral navicular syndrome of the front feet many years ago. She has not received any specific therapies since diagnosis and is currently maintained barefoot. Jessie’s main areas of concern after thorough physical and myofascial exam include decreased cervical range of motion, muscle atrophy and increased sensitivity of the hamstring muscle groups bilaterally, and lumbar spine muscular hypertonicity. After three treatments of acupuncture, Jessie was observed to be ambulating more comfortably and frequently, and has increased range of motion in her cervical vertebrae. Her foot flight arc is still shallow but improved. The lateral flexion of the spine has overall increased range of motion and Jessie is now able to tuck her pelvis when pressure is applied to the caudal sacrum. Jessie, a 25 year old Quarter Horse mare, presented for acupuncture evaluation due to decreased ambulation and increased visible discomfort walking. Jessie was a western pleasure show horse who was retired 10 years ago due to the diagnosis of navicular syndrome. Her care was then transferred to my client. Jessie has been maintained barefoot, and has not received any medical treatments for her navicular syndrome. She is occasionally used for light riding for children (twice a year) and she receives some oral phenylbutazone prior to and after these riding events for comfort. Jessie is fed alfalfa hay and lives in a 20’ x 30’ dry lot. She is occasionally has access to a larger dry lot. The goals for treatment are to increase Jessie’s comfort ambulating without having to rely on more frequent phenylbutazone for comfort. Jessies physical exam parameters were within normal limits. She was bright, alert, and comfortable with no increases in digital pulses, heart rate, respiratory rate, or temperature. Abbreviated neurological examination was within normal limits. Assessment of Jessies clinical status revealed a stiff gait, with minimal bending of the carpus and lower limb with both front limbs, walking with a paddling motion. She drug the toes of all four feet in the ground, with shallow hoof flight arcs in all four limbs. The right hind limb is placed axially and the hock bows lateral as weight is placed on the limb. The gait is overall short and “choppy” with a lack of fluid motion. Balancing tests performed on the limbs revealed reluctance to lift the front limbs and abduction of the hind limbs. Myofascial exam did not reveal any areas of restriction, however hypertonic lumbosacral musculature was observed and was symmetrical. There was diffuse muscle wasting in all muscles of the pelvic limbs, most notably the semitendinosus and semimembranosus groups. Joint mobilization revealed reluctance to flex and extend the head, reduced range of motion of C5-C6 to the left, and overall reluctance to bend the entire neck to the right. 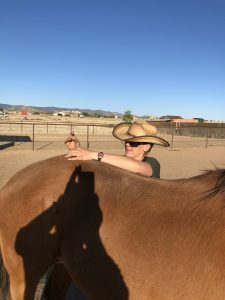 There was reduced range of motion in the front fetlocks, bilaterally, and when asked to stretch each front limb forwards, Jessie had extreme difficulty balancing on three feet. When her balance was obtained for a short period of time, her head was able to be lowered enough for her gator to be considered negative for both front legs. Lateral flexion of the spine revealed decreased motion in the lumbar spine starting at the thoraco-lumbar junction on the left, and mid-thoracic on the right. There was an absent response to my pelvic tuck request. Hind limb circles were normal with the limb at rest, bilaterally. When the limb was asked to gradually make circles caudally, there was reluctance and resistance to this caudal stretching, bilaterally. The left hind was worse than the right. Navicular syndrome of left and right front hooves: In addition to reported diagnosis 10 years prior, Jessie will place her weight very heavily toe first, reluctant to load the caudal hoof. She is hoof tester positive in the caudal hoof and frog currently. I believe this compensated gait has led to decreased range of motion of the pastern and fetlock joints over years, perhaps causing osteoarthritis or soft tissue thickening of each joint. The hoof placement combined with historical diagnosis and patient signalment leads me to give a navicular syndrome diagnosis. Tarsal osteoarthritis of the left and right tarsus: Jessie has decreased range of motion of both tarsal joints. She has a history of steady riding work when she was younger, providing potential wear and tear on the joints. While tarsal radiographs were not performed, both tarsi are “boxy” in appearance, suggesting osteophyte production of the multitude of cuboidal and metatarsal bones. The toe dragging in the hind limbs is not specific for hock osteoarthritis, but her toe dragging combined with a subsequent stabbing motion into the ground is suggestive. The hypertrophic lumbar musculature and the subsequent lumbar spinal pain can be a consequence of hind limb discomfort. Stifle osteoarthritis of the left and right stifle: Moderate effusion is present in both stifles. Jessie’s short stride and toe dragging can also be an indication of stifle pain in addition to tarsal discomfort. The presence of effusion and the presence of moderate to severe semitendinosus, semimembranosus, and biceps femoris atropy and pain indicates stifle discomfort. With a chronic history of front end lameness, compensation with the hind end over a long period of time can lead to degenerative changes in these compensation mechanisms. My initial approach was to ensure Jessie’s comfort and acceptance of acupuncture. She has not received an acupuncture treatment before, so I wanted to ensure that I could help treat some main areas without overstimulating her nervous system. I saw her issues divided into two main groups, her front end discomfort and her hind end discomfort. Her reluctance to pick up her front feet off the ground and inability to balance with a font leg extended forwards led me to focus on cervical comfort and mobility as well as eventual goal of trapezius muscular support. The hind end discomfort could stem from a whole multitude of issues. With a chronic front end issue, it is likely that attention has been focused away from any hind limb abnormality. The obvious muscular abnormalities in the hind end included the hypertrophic lumbar musculature and the atrophied hamstring groups. The right hind limb bows lateral as she is walking, which might indicate weakness of the stabilizing muscles medially. Jessie’s lumbar spine tension could be treated week after week but it would still persist if the source of mechanical constraint and compensation wasn’t modified. The lumbar spine will be treated, to help relieve the myofascial tension and lack of lateral movement of the vertebrae, but additional points will be incorporated to try to address the muscle atrophy and improper use of the stifle and hock joints. Needles: 0.25 and 0.20G x 40mm Serin acupuncture needles used. No electrostimulation. This visit was the first time Jessie had received acupuncture, the acupuncture treatment was more conservative. The main goal was to address the left cervical pain and tight musculature, lumbar spine hypertonic musculature, and begin to address the hamstrings. Jessie was fairly tolerant of needle placement, but did not want to have the needles stimulated. GB21 was placed in each side to gauge the patient’s reaction to needle placement as well as provide calming input, Bai Hui was also placed as a calming point and for pelvic pain. LI 17 was placed in the left side as there was moderate reluctance to bend the neck to the right as well as a tight band of musculature in that area. BL 54 was placed bilaterally to help stimulate the cranial gluteal nerves and address gluteal pain and possible sciatic nerve dysfunction. This treatment the goal was to place needles in more areas that were tender and/or restricted. 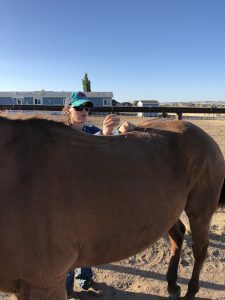 Fly season was starting to become aggressive, so Jessie was initially more resistant to any needle placement, immediately using her panniculus reflex to fling needles out of her skin. Because of this resistance, I had to carefully choose the few needles I could place. GB 21 was utilized as both a calming point and for caudal cervical decrease in mobility. Left LI 16 was successfully placed, but excessive panniculus motion prevented the right one from being placed. LI 17 on the right was utilized as this area was sore and Jessie had decreased mobility approximately C4-C5 to the left. BL 21 and BL 23 were repeated, as well as left BL 54. BL 13 was used as significant pain was felt in this area and Jessie was amenable to needle placement here. ST 36 was utilized as both autonomic nervous system influence and aid with the hind end weakness and sore musculature. Bai Hui was utilized as both a calming point and for pelvic pain. Needles: 0.25 and 0.20G x 40mm and 0.16G x 30mm Seirin acupuncture needles used. No electrostimulation. Jessie was still sensitive to needles in her caudal cervical region, but Bai Hui and any points in Jessie’s caudal portion of her body were well tolerated. Huatuojiaji points were placed from T16-L1 bilaterally to aid in improving the continued lumbar spine musculature hypertonicity and reduced lateral flexions. After 3 minutes these were removed, and BL 20, BL 21, and BL 22 were placed bilaterally. BL 12b and BL 12c were placed on the right side to address the reactivity of that area. SP 6 was placed bilaterally to address the hamstring pain. ST 7 and BL 10 were placed on the right side for the right TMJ and atlantoaxial reactivity. Jessie’s owners are pleased with progress over the first three treatments. Recommendations of incorporating carrot neck stretches and hand walking over ground poles were given to encourage strength building and flexibility. With continued acupuncture treatments as well as proper stretching and exercise, I believe we can bring this horse’s comfort level up without adding daily NSAIDS. No references used aside from course content.